BioProfile FLEX2 combines Nova’s groundbreaking MicroSensor Card technology with optical measurement and freezing point osmometry for an automated and comprehensive cell culture analyzer that eliminates chemistry sensor maintenance, increases analyzer speed, and reduces sample volume. The full 16 cell culture test menu includes: Gluc, Lac, Gln, Glu, NH4+, Na+, K+, Ca++, pH, pCO2, pO2, total cell density, viable cell density, viability, cell diameter, and osmolality. Compared to the previous generation BioProfile FLEX there is no maintenance for any of the 11 chemistry and gas sensors, sample volume for the full text menu is reduced by 75% to 265 microliters, and test time is reduced to just 4.5 minutes. Automated sampling from 96-well plates, syringes, or a 24-position external “load-and-go” sample tray provides maximum workflow flexibility and efficiency for cell culture monitoring. Chemistry and gas biosensors are combined in the credit card sized MicroSensor Card, which uses proven Nova biosensor technology that has been validated in thousands of cell culture processes. MicroSensor Cards are maintenance-free, and replaceable in seconds. FLEX 2’s RMS features smart reagent cartridges that are easy to use with simple snap-in replacement. • RMS automatically captures cartridge installation date and time, lot number, and expiration. • RMS monitors reagent usage and provides real-time reagent status and alerts, maximizing analyzer readiness. • A self-contained waste receptacle within the cartridge eliminates direct handling of waste and direct contact with hazardous trypan blue and biological materials. Other systems can pose significant waste handling hazards to operators. 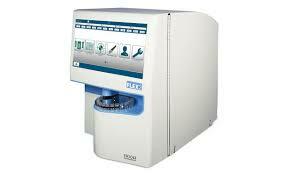 Comprehensive test results including cell density/viability, pH/gases, and key chemistries are available in 4.5 minutes. Throughput for individual modules is 2.0 minutes. 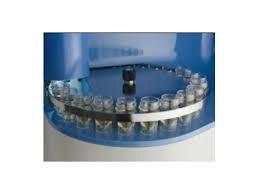 Sample volume is 265 μL for a full 16-test profile, enabling comprehensive testing even from low volume culture systems. Individual modules require as little as 135 μL.